It's all to common that while we are on holidays overseas, in a different state, anywhere we don't live we do a lot of exploring to experience as much as we can. But when we are home, living our normal day to day life we very rarely explore what our own back yard has to offer. Well seeing I am now home for a few months I intend to do some exploring in my city Melbourne and as I proved to myself today, see it in new eyes. 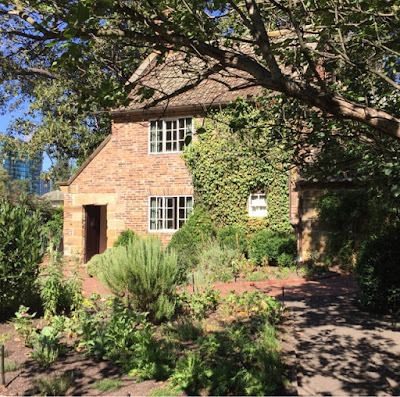 Today I decided to head into the city and have a look at Cook's Cottage in the Fitzroy Gardens. After visiting the new visitor information centre to pay my $4.50 entry fee I wandered over to the cottage. 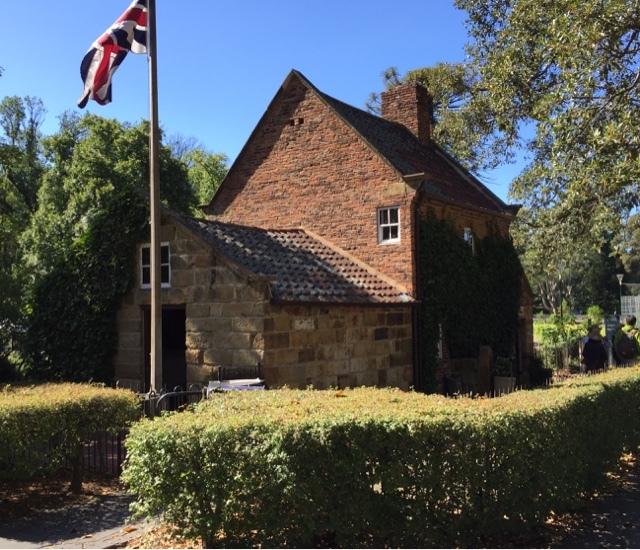 Built in 1755, Cook's Cottage is the oldest building in Australia. Cook's Cottage, a gift from philanthropist Sir Russell Grimwade, was bought from Yorkshire to Melbourne to commemorate Victoria's centenary in 1934. 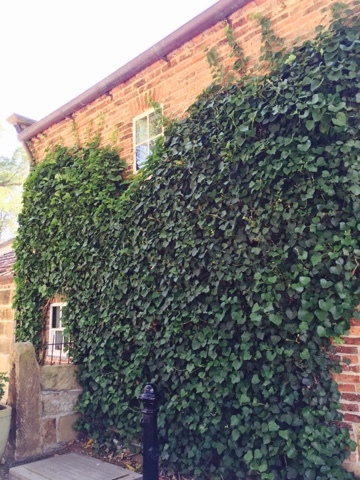 In England the cottage was originally owned by the parents of Captain James Cook. Each brick was individually numbered packed into 253 crates and shipped to Australia. house and it is still growing in this delightful cottage to this day. The beautiful cottage gardens are filled with many plants that would have been very common in an English 1700's garden. After visiting the cottage I decided to have a better look at Fitzroy Gardens. I have driven past these gardens literally hundreds of times, but never explored them and I must say I was very pleasantly surprised. 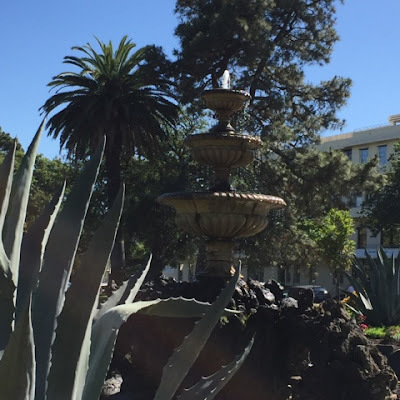 I never dreamed these gardens were so pretty with so much to offer and so much history. Fitzroy Gardens are named after Sir Charles Augustus Fitz-Roy. Governor of the colony of New South Wales 1845 - 1855. Governor General of Australia Colonies 1850 - 1855. 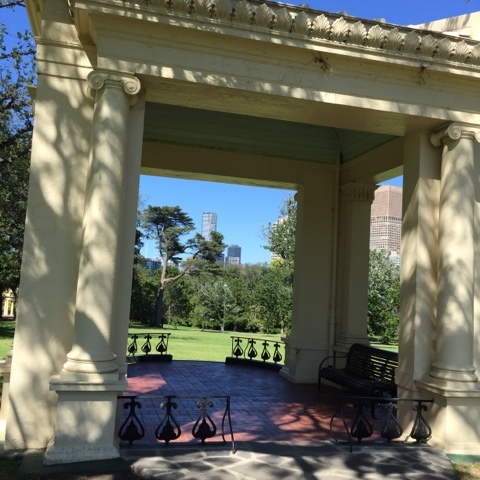 Set aside as a reserve in 1848 the gardens follow a classic Victorian era design. 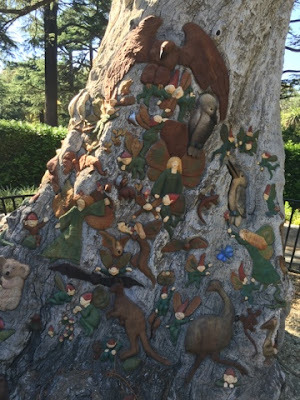 Fairies' Tree - Sculptured by Ola Cohn between 1931 and 1934, the Fairies' Tree is beloved by generations of children. 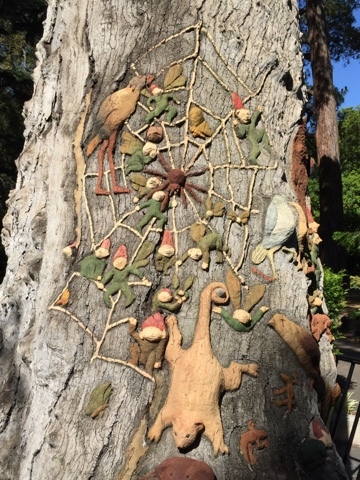 The carving incliudes Australian animals, birds and bush spirits. 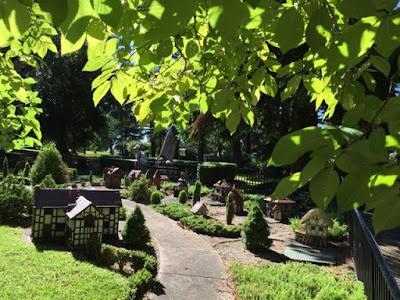 Model Tudor Village - The model village was a gift to the people of Melbourne in 1947 from the citizens of Lambeth, England, in appreciation for food parcels sent during WW11. 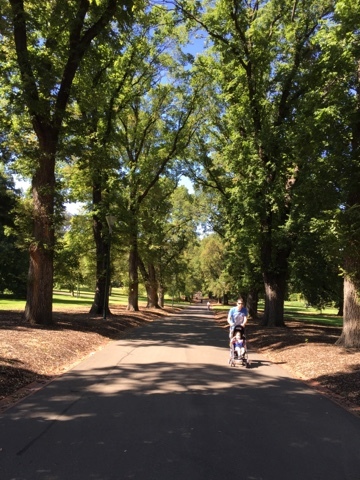 Elm Tree Avenues - The beautiful mature English Elms that line the major paths provide a mystical feeling and some lovely shade on a warm day. 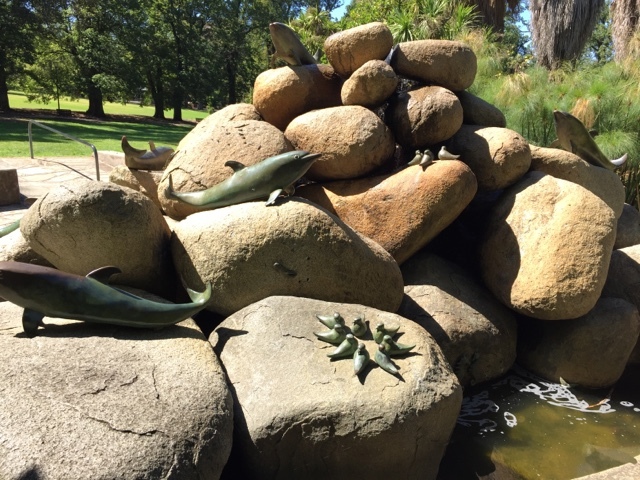 The Dolphin Fountain - This fountain was created by sculpture June Arnold in 1982. Featuring a variety of marine creatures it is a very interesting structure. The Rotunda - Created in 1873, the Rotunda is another example of the sculptural elements popular in 19th century gardens. 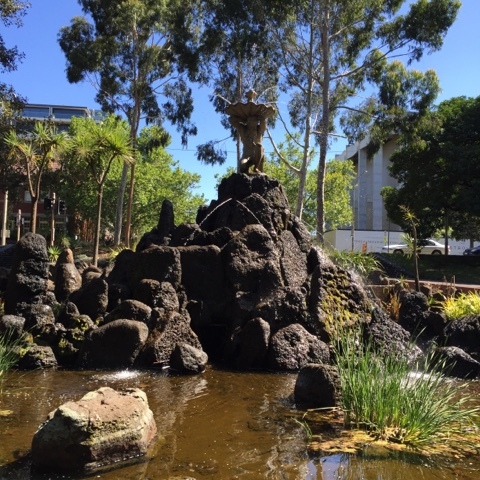 River God Fountain - At the northern end of the gardens is Melbourne's oldest surviving public artwork. 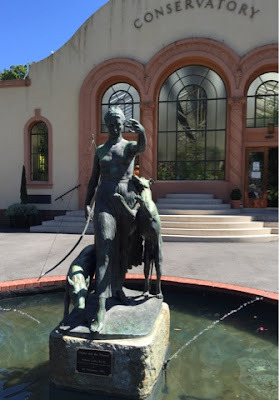 This fountain was created in 1862 by leading sculpture Charles Summers. Grey Street Fountain - This is one of the original five fountains installed in the gardens in the 1860's. The three tiers of vases on the rock pedestal is a classic garden ornament of the 19th century. 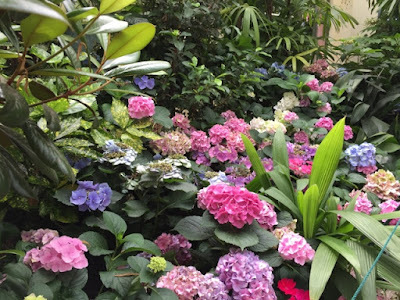 The Conservatory - With the magnificent 1940 statue of "Diana and the Hounds" the colours of the hydrangea's inside are equally magnificent. 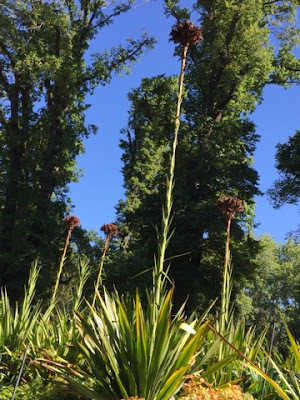 As I mention before these gardens had so much more to offer than I had ever thought and I would recommend anyone in Melbourne CBD, to go for your own exploration of the Fitzroy Gardens.